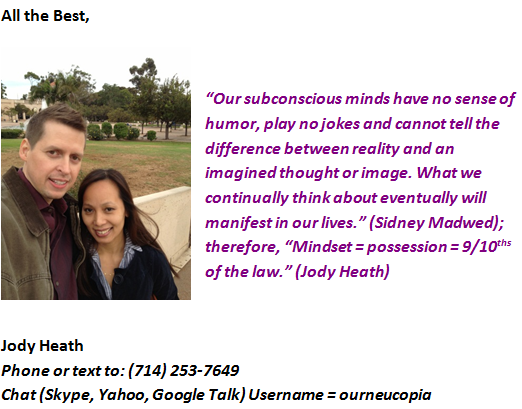 They have lowered the cost to join neucopia at the basic level to $49.95 and ZERO fees. That’s right, you pay $49.95 to get started at the basic level and not one penny more. 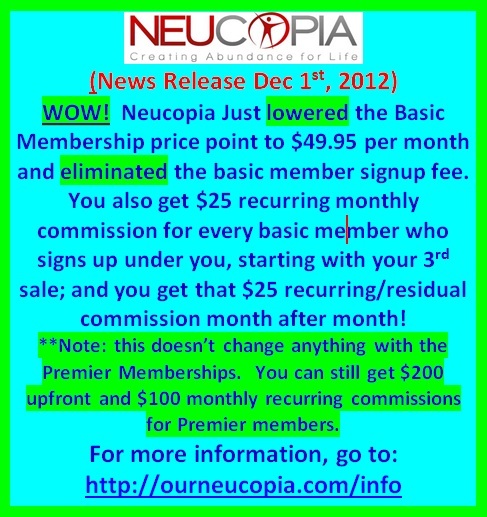 Neucopia will pay a 10% match on all premier members you (even as a basic member) recruit. Starting with your 3rd signup, you get $25 upfront for every $49.95 basic affiliate membership you recruit; then you get $25 recurring residual income each and every month for the life of each of your $49.95 basic membership signups. When we started there were some corporate videos and there is already a fantastic corporate static website. Most of us affiliates used those tools along with our own YouTube videos, websites, and social media to really build up something fast. Well that’s about to be amped up quite a bit. Because by about middle of this month (Dec 2012) there will be a state of the art Webinar and corporate sales funnel activated. So what does that mean for recruitment. This is going to be a phenomenal sales tool to really showcase what Neucopia is to mass numbers of prospects. This is going to be the sheer essence of a true passive income model. **Note: this doesn’t change anything with the Premier Memberships. You can still get $200 upfront and $100 recurring commissions for Premier members. I look forward to you taking the Neucopia Tour. I’ll receive a notification from Neucopia after you register; and I’ll be 100% available to you for questions and support. Fantastic blog you have here but I was curious about if you knew of any message boards that cover the same topics talked about here? I’d really love to be a part of group where I can get advice from other knowledgeable individuals that share the same interest. If you have any recommendations, please let me know. Thank you! Hi Jarret, I’m a member of Neucopia; and with that, I’m an automatic member of a private Facebook group of around 700 online marketers and jam packed full of files on internet marketing and how to be successful. We share knowledge and have some very big time marketerss in the private group who share information all the time, geared toward helping us all promote Neucopia. Navigate to my contact tab, reach out to me, and let’s talk; I’m sure I can help. Hi, Thanks for visiting my blog. A self-hosted WordPress.org website/blog is one of the most customizable platforms you will find. You just need the right host, theme, and combination of plugins. My Blog theme is Socratese. And if you look at the banner adds at the top of my blog, the banner add rotator is built in to my Socratese software. It is a great looking theme right out of the box! The problem with some other themes with great interfaces, is they can take a good bit of coding knowlege and time I don’t have at the moment. Socrates is also SEO, click-bank, and Google Adsense optimized. So I balanced a good price ($28.00) with functionality and look… and the Socratese theme came out on top. Plugins are a topic for another discussion, but I can help you with those as well. Thank you, Let’s talk real soon. [url=http://www.softassembly.com/Anvi-Smart-Defender.html]discount Anvi Smart Defender[/url]. Anvi Smart Defender Anvi Smart Defender delivers smart and powerful protection against malicious software, such as virus, Trojans, adware, spyware, bots and other threats. With the newly designed swordfish engine, it scans and detects Internet security threats fast and lightly. It adds system optimization function to speed up slow PC and provides cloud scan feature to give PC more effective and powerful protection. Our WildStar Power Leveling group is made of professional power levelers. We will provide WildStar Power Leveling services for you all by hand-work without any bots or macros to make your account safe. 100% manual work will guarantee your characters security and level up much faster! During WS Power leveling order time, all the drops (Item and Gold) belong to your character’s. We have been constantly trying our best to finish our orders quickly, efficiently and smoothly. We guarantee that we will start your WildStar power leveling order in 15 minutes after your payment has been processed. Our skilled gamers all have the professional experience and will work hard for you 24 hours a day, 7 days a week. Our fast WildStar power levelwill impress you and you will be happy to come back to us more and more times. buy cheap bridesmaid dresses from following website, you will be satisfied with their goods and service. Hello! I simply wish to give you a big thumbs up for your great information you have got here on this post. I am returning to your blog for more soon.